Three Beded Room with atteched Toilet. Light and Fan (Electricity) available. Car for sight seeing locally available. Arrangement of Group Acomodation (25-30 heads) Available. Extra item available with extra charges. Point-4:Baranti-Joichandi Hills-Raghunathpur Tasar Silk Market. Circular Tour (Village Tourism) from Kolkata: Kolkata-Santiniketan-Tarapith-Maithan (Via-Churulia)-Panchyet-Baranti-Bishnupur(Via-Mukutmonipur)-Kolkata (Via-Joyrambati). If you are interested in butterflies, Fireflies, beetles, dragonflies or any other insects, Baranti Insects is an alternative for your vacation and an aid in your research. We can drive you into insect's paradise "The Baranti Hill area” where thousands of different species live. Our goal is always to assure the best to entomologists, students, wildlife photographers and nature lovers wishing to visit The Baranti Hill and Forest Area. Apart from this in every year Many individuals or groups of students and researchers are comming here for Camp/Summer camp on EVS Study, Socio-Economic Study,Nature Study, Fine Arts, Photography, Anthropology , Geography and Geology Ect. We also understand that more and more travelers and researchers want to build their own itineraries according to their group and special interest. We provide Accommodation and food . We furnish local tribal guides, vehicles, and tour itineraries for a day, a week, a month or more, for one person or a large group (25-30). santhal is one of the most abundantly found tribes in India. A major chunk of this tribe can be found in West Bengal and Jharkhand. Santhal tribe has a rich cultural lineage and immense solidarity. Its members are basically the devotees of 'Thakurji', the deity they believe created this world. 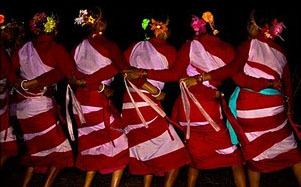 They move to the beats of music, to celebrate the glory of nature, raise a message and offer prayers to the presiding deity of their tribe, through a dance known as Santhal dance. The Santhal dance is considered to be one of the best tribal folk dances of India, which offers immense vibrancy and cheerfulness. Santhal dance is generally performed by both the men and women of the Santhali tribe. It often covers issues related to gender and land rights. While performing, the male Santhali dancers are dressed up in dhoti and make use accessories, like turban, tree leaves, flowers and bushes, during the dance. The dance is basically performed on special occasions. During the spring festival, it is performed to the glory of nature. Santhali dance is accompanied with folk music instruments like flutes, pipes, drums and cymbals.The Baranti visitors who are interested about santhal dance Baranti Wild Life & Nature Study Hut arrange special programmes (costing Rs. 1300 to 1500 for each 2 hours programmes) The dance is performed by both the men and women of the Santhali tribe( 30-50 members) living in Batka Village near Baranti in Balitora Gram Panchyet. Purulia. The club who are performing this dance is “Batka Adibasi Hara Rakab Gaota”. The cultural heritage of a State, is preserved, among many things, through its folk traditions. Chhau, a mask dance, performed in certain areas ofWest Bengal, has a distinctive character of its own. 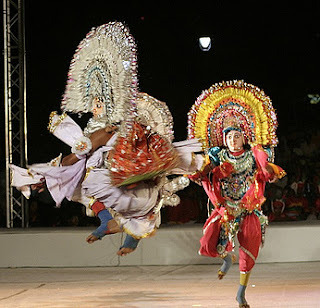 Although this dance is part of the folk cultures of Bihar and Orissa as well, the Bengal Chhau, which has received international acclaim in recent years, has scaled a rare height of beauty and perfection. Essentially a festival dance, Chhau was originally performed on the occasion of the sun Festival towards the end of the month of Chaitra (March-April) in Bengali Calendar. The festival continued for about one-and-a-half months till before the sowing season which indicates it was interlinked with the social and economic life of the Bengal farmer. The situation has changed with the passing of time, as Chhau is new performed during some other festivals at other times of year as well. The Chhau dance is epical in content, as it is based on various episodes of the Ramayana. And the Mahabharata. Sometimes certain episodes of the Puranas are also used. The Baranti Visitors who are interested about Chahau Dance , Baranti Wild Life & Nature Study Hut arrange Chhau Dance Programmes. The Dance is perform by Local team from Raghunathpur or Purulia.